Curling up with a good book and a cat is a heavenly experience. Libraries and bookstores know that, and having a cat around is not only good for customers relations and advertising, they also keep mice away. And they make the folks who work there happy. Over the years, we’ve brought you several lists of bookstores and their resident cats. Here are a baker's dozen more of them for your enjoyment. Weiser Antiquarian Books in York Beach, Maine, is the oldest occult bookstore in the United States. As such, the store is almost obligated to have cats. Those would be Noodle and Freddie, who are both male and brothers. Freddie is pictured here. The Kelmscott Bookshop in Baltimore lists Pierre and Upton Sinclair on their staff page as security (Pierre) and apprentice security (Upton Sinclair). The older Pierre is the white cat. Both were strays taken in by store employees to lounge among the books and greet customers. Pierre’s hobbies include “eating, tripping customers, stealing pencils, and learning French.” They also note he’s not the smartest cat. Moby Dickens Bookshop in Taos, New Mexico has always included a cat or two on their staff. The current residents are Tony and Mabel Dodge Lujan. They were no doubt named after Taos art patron Mabel Dodge Luhan and her fourth husband Tony. Customers love the cats. Emily Grace lives ands works at The Edisto Bookstore on Edisto Island, South Carolina. She was a stray taken in front he parking lot. Emily Grace takes her responsibilities at the store seriously, but only works for about an hour a day. Then she has to take a nap. Visiting authors get their photographs taken with the usually-asleep Emily Grace, which you can see on their Facebook timeline. At a store in Daytona Beach, Florida, named Abraxas Books you’ll find a cat named Sterling overseeing operations. See an earlier picture of him at Facebook, and another as a kitten when he first came to the bookstore. 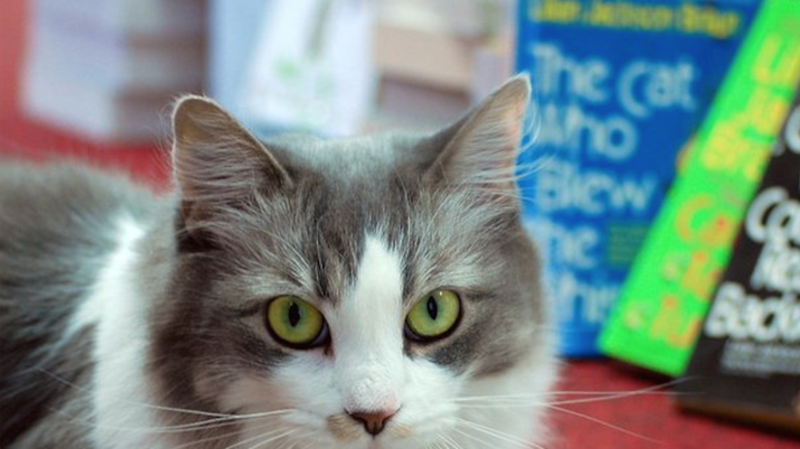 The Bookman bookstore in Colorado Springs, Colorado, has two resident cats named Mr. Blue and Mr. Gray (sometimes spelled Grey). Mr. Gray is the darker of the two, and every Facebook post carries his profile picture. We mentioned Already Read Used Books in Alexandria, Virginia in a post several years ago featuring their cat Gwenievere the Bibliocat. Gwenievere passed away shortly after that was published. Now the store has two Bibliocats, GwenieB (apparently named in honor of her predecessor) and SweetPie. GwenieB is on the left. There are stories about the cats at Facebook, like the one in which they guarded the store against dogs.